Erythropoiesis refers to the formation of erythrocytes. 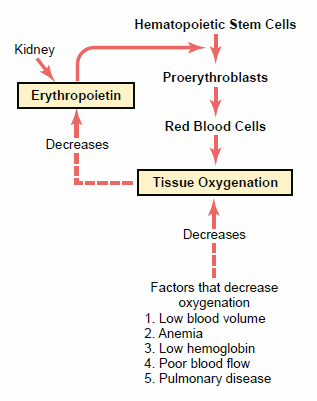 Tissue oxygenation is the most essential regulator for this continuous process. Thus conditions like anemia, high altitudes, pulmonary disorders or heart failure cause tissue hypoxia. As a result of this, erythropoietin (EPO) is released from kidneys. It is glycoprotein in nature and 90% of it is produced in the kidneys. The remaining 10% is produced in the liver. This is why in cases where the kidneys have been removed or damaged by diseases, anemia results. The hypoxic sensor is believed to be the high oxygen-consuming renal tubular cells. If the hypoxic blood is unable to deliver enough oxygen from the peritubular capillaries, then the renal tubular epithelial cells are thought to release the erythropoietin. There may also be a non renal sensor because at times localised hypoxia elsewhere in the body can also lead to erythropoietin secretion. The effect of EPO is that it stimulates the production of proerythroblasts from hematopoietic stem cells in the bone marrow. Once these proerythroblasts are formed, EPO increases their speed of maturation to finally yield more new red blood cells. Genesis of RBCs is a link showing the various stages of maturation of an RBC.